Burger King might seem like your friend, given that it's got an inviting monarch for a mascot, but with its newest stunt food creation, the fast food giant is likely declaring war on your bowels. 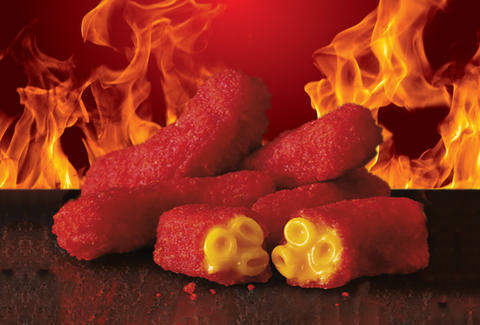 That's because the chain is debuting a demented take on the mozzarella stick: the Mac n' Cheetos are like the regular fried cheese sticks you might hoover up and wash down with a cold pitcher of beer, except they're filled with macaroni and cheese. They're back on sale starting November 30 at most Burger King locations across the country for a limited time, according to the company. But this time, you'll find a layer of Flamin' Hot Cheetos flavor dust coating the cheesy snacks. They're basically a regrettable dietary decision commoditized, sold in packs of five by the royal burger peddler for $2.69 each. This isn't the first time Burger King has wedded the unlikely co-conspirators of Cheetos and mozzarella sticks. Last June, it debuted regular Mac n' Cheetos, which hit stores with a smattering of regular Cheetos seasoning on their crusty ridges. Now, as you can see, Burger King is just following up with the logical next incarnation of its Cheeto-influenced slate of offerings. Blazevich might regret his calls for customer feedback, given the gastronomic consequences of consuming Hot Cheetos and mozzarella sticks en masse. But then again, maybe he'll be pleasantly surprised with the results, especially as winter provides ample reason for the comforts of junk food.